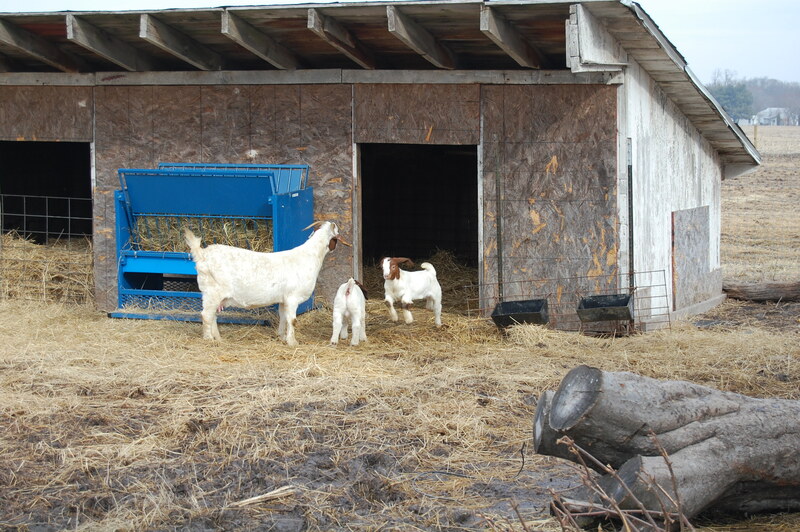 Yesterday was the perfect day to move the goats from their well-protected kidding pen to the great outdoors. We had spring-like weather and another good day predicted for today, to help get them acclimated before that nasty, tired, 4-letter word, S.N.O.W., enters the forecast for tonight/tomorrow. The mamas followed me, well, actually the feed bucket, perfectly to their outside pen. The babies were supposed to follow their mamas. When working with livestock, seldom does it go as it is supposed to. 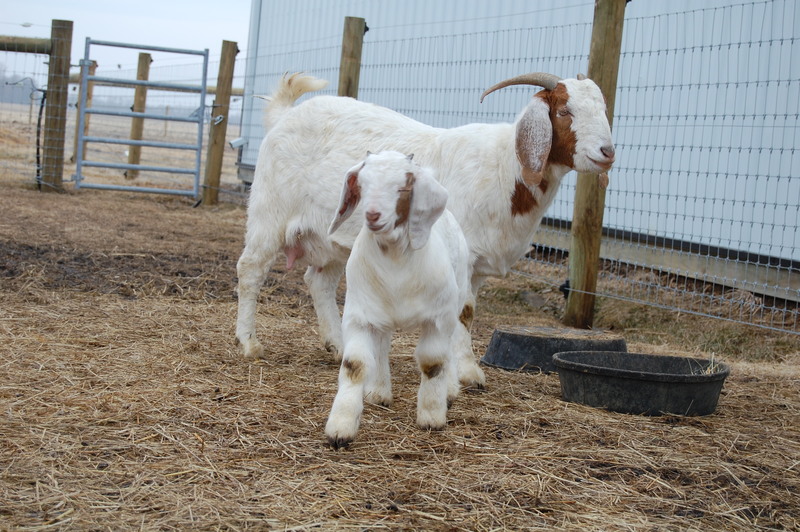 The babies were confused and playful; preferring instead to hop in and out of their kidding pen and run in circles. I had to catch each one and carry it to the outside pen. Not a one would follow the leader. 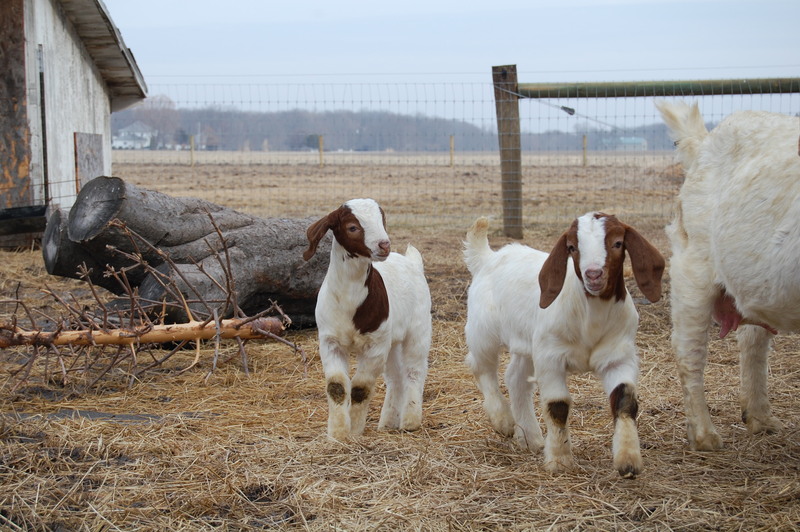 Once in their new pen, they began to explore. This included their introduction to the electric fence. :O The kids sound strangely human when they yelled their shock. Get it? Shock? As they were also joining and meeting the two older wethers, there was a little hierarchy being sorted out. A little “King of the Mountain” being played. Mainly, there was sweet enjoyment, curiosity and sunshine! 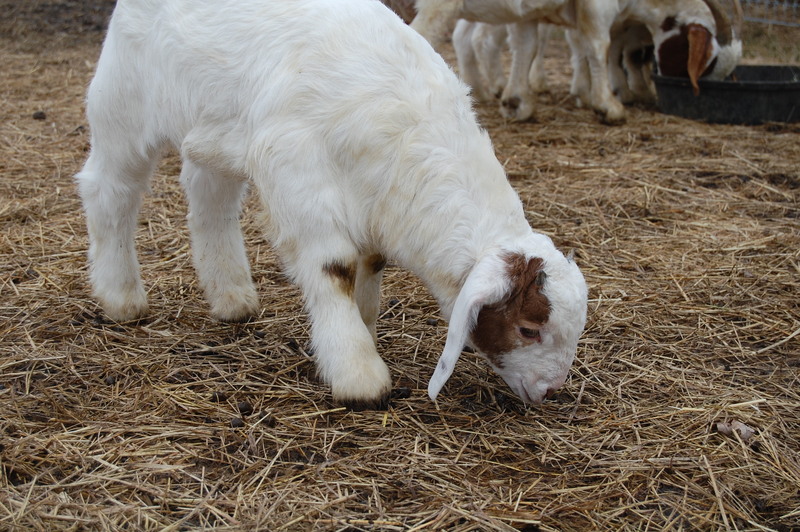 This entry was posted in Boer Goats, Country Living and tagged Boer Goat Kids, chores, farm animal photos, Illinois Country Life, Spring on farm. Bookmark the permalink. 17 Responses to Welcome to the great outdoors! oh I love them….I miss my girls! 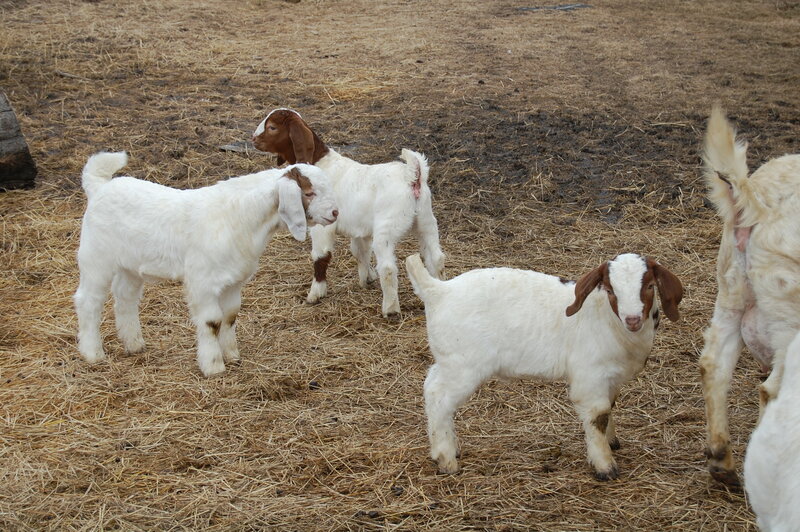 Do you know how many goats you want to eventually have? They are adorable. How can one not smile when looking at their antics??? 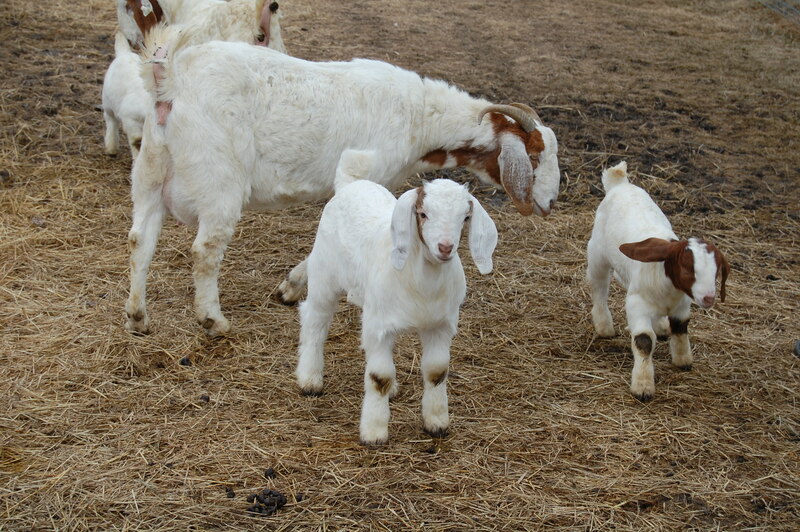 Nothing cuter than baby goats playing! Just like children let lose from a stale and musty classroom!!! LOL! Yes, it was definitely recess!! I bought the ceiling, wall and trim paint yesterday! Love those young ones! 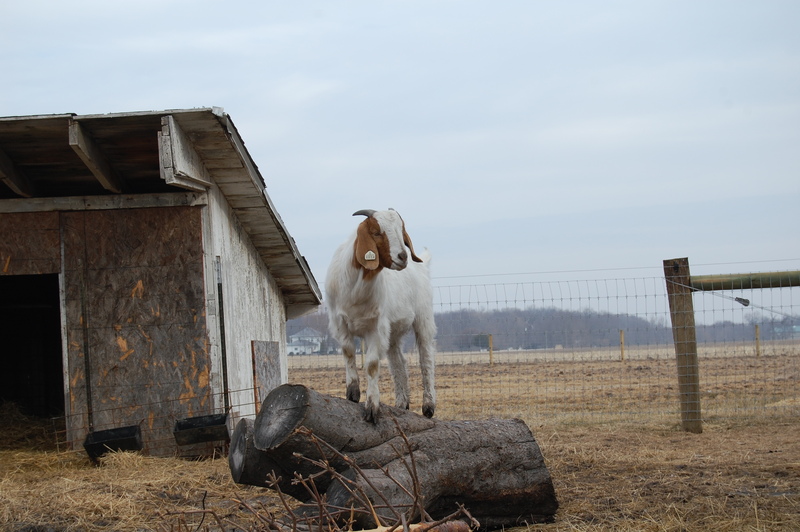 King of the Mountain–somebody always has to be the boss. I catch myself just standing and watching…. who needs cable?? Be still my goat loving heart!!!!!!! And I am really beginning to hate the SNOW word!! I am way over the snow! Rain so far today. Cold, cold rain. I’d like to hold those baby goats. Do they have a smell? Why didn’t Pig Farmer close in the roof rafters sold the cold couldn’t get in? They don’t smell very much … especially when outdoors and not enclosed. The little, OLD, barn that is their home now, was on the property when we moved here. It isn’t in very good shape, but is getting us by for now. I think so, too. But OH MY it is muddy out there now! We got a lot of rain last night.